Sorry nothing new from me. I'm sick. I've been sick for 4 days and can't stand it any longer. I am finally giving in and going to the doctor today. My Mom, my brother, my kids and I went to my children's school Harvest Festival last night. The Harvest Festival is like a carnival and it is used for fun and to help raise money for our school. Kids had a blast and there was an Elvis sitting....(my neighbor) lol. I made a layout for Scrap Our Stash but I can't post it here until they post it there...so you can look forward to seeing that in the near future. I also made two cards. One just because I wanted to use my Cuttlebug and one for a card challenge at Sketches4you. 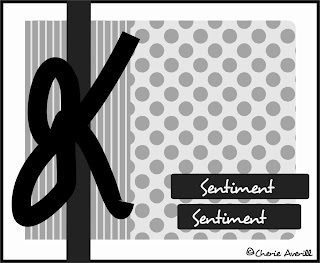 It is Dannette's Card Sketch Challenge. I used my Doodlebug scraps from my SoS layout so it went pretty fast. 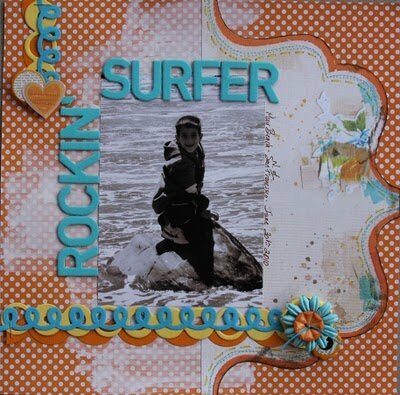 I am showing you the one I did for Dannette's challenge. Hope you are having a scrappy Saturday! Karen at Feline Playful is having a celebration! Just look at all that yummy goodness!!! Woo Hoo!! I reached 600 followers today!!! I logged on to just check things out and this is what I saw! I know I was excited when I reached 500 and said I was probably going to add something to my Blog Candy Giveaway. And have not gotten around to doing it yet. Welllllllll......I have decided that I need to do something extra special to thank all my followers!! Especially since I have been so crazy busy lately that I haven't even been posting anything interesting to look at!!!!!!!!!! This kind of happened to me as a surprise so I don't really have anything pre-planned. I am going to pick an additional 6 names on November 1st and send a small rak to each of you. What I send will be a surprise but it will be a good one. Not as much as the main prize but still definitely worth getting. And I will still pick the first name for the original Big Candy Giveaway. And after I post the names of the winners you will have to email me your mailing address by November 7th or I will draw another name to replace yours. So there you go...exciting news!! Thank you so much for being such great followers!! I haven't done anything for over a WEEK! I have been way, way too busy! This weekend my husband and I went to California to my Goddaughter's wedding in Auburn. They drove up to meet us in Dry Town on Sunday and we spent the day wine tasting. We checked into our B & B in the early evening and then went to a fab dinner at a cool restaurant called Taste. YUM! Getting there was a bit tricky. It was a cool, foggy, dark (super dark) night and Holly's phones GPS basically sent us out to a empty field in the middle of nowhere... It was just like it was out of a scary movie! We did eventually find out way to the restaurant safely and had an awesome dinner. We flew home this afternoon. 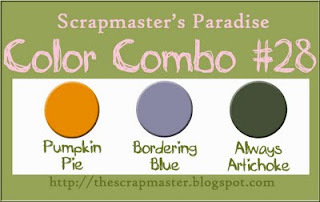 My plan is to make something scrappy tomorrow...(really...that is my plan) and if I actually get something made I will post it for your viewing pleasure! I hope everyone had as nice a weekend as we did. Why are you here instead of at Marlene's blog reading all of her snarkiness and looking at her wonderful art?!! Marlene is one of the funniest woman out there writing a blog today and she is a wonderful artist too. Her blog is not to be missed! And if her awesomeness isn't enough....she is giving away CANDY!! You all should rush over to sign up to follow her and then you will definitely want to follow her. She is the best! And she is sweet too. See this card pinned up on the wall by my desk??!! She made this Zombie card which is hysterical and posted it on her blog. And what did she do??!! She sent it to me! So here it is pinned to my wall and I am smiling just typing about it. So see what good karma she is sending out?? You should look at her card in the second picture up close. It is not only funny but really gorgeous in person. Anyway, go check her out. You will be happy you did. And you might even win some candy! 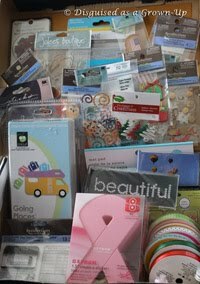 My friend, Denise is having a blog candy giveaway on her blog. 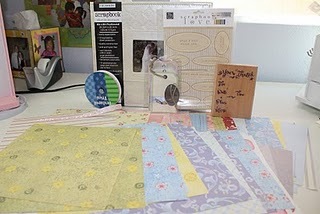 http://lalasworldblog.blogspot.com/ She is giving away some super yummy stuff. She has an awesome blog that you should be following anyway so go check it out!! The challenge this month is to do "That Layout". The one that you have put off doing for whatever reason. This is a great little push to help you get it done. I chose to do a layout about my dog, Tucker, who died last year. When he died it was just too fresh and hard to think of doing anything. It has been a year and it was still hard (I cried the whole time I was scrapping) but it was doable. And now I have a nice page to help honor his memory. I am a major "dog person" and this dog was my kid before I had kids and he was my kid until the day he died. (he is still my kid) If you aren't this kind of dog person you will probably think I am a little silly but that is okay. I loved him and he loved me. And I am glad he was in my life for 14 years. And if love could have kept him alive he would have lived forever. I made the leaves by stamping the leaf pattern on my pp and then I used my bone folder to outline the veins and then folded each vein to give the leaves depth and dimension. I would like to encourage you to go over to Scrap Our Stash and check out all the great creations that people are doing for this challenge. And use this challenge to encourage yourself to do "That Layout". My sweet daughter, Georgia turned 3 today! Just thought I would share a picture of her and her brother. I can't believe she is already 3! That child is really a pistol!! We are so very lucky!! I am also sharing a picture of all the kids in front of Chuck E Cheese's. We went there this week for a fund raiser for their school. And.... I am finally posting some scrappy stuff!! I made this layout for our DT sketch at Sketches4you. I used an old picture of my son and daughter that I think is sweet. My son is actually 2 years older than my daughter but they were around the same height at the time of the picture....she towers over him now! We are still cleaning and decluttering....did I mention I had 5 kids??!!! Sorry to have been gone so long but we are doing heavy duty cleaning and decluttering at my house this week and we started on Friday. With 5 kids the junk just piles up and since we are putting our house on the market to sell we need to make it look nice. My sister was sweet enough to come out and help me. And thank goodness for her because there is a ton to do and she is a super high energy happy go getter! (why is it that she is the only one who got all of that??! ha) (couldn't she share a little??!! lol) Here's a picture of that sweet little helper! Anyway, I did a couple of layouts before we started cleaning but they are both not posting until Monday so you will have to wait to see anything new on my blog until tomorrow. I am also excited to see that I have passed 500 followers!!!!!!!!!!!!!!!!!!!! WOO HOO!! I'm so excited - I might have a little something extra to add to my blog candy giveaway!! So be sure and check back tomorrow. Here is my project for today. 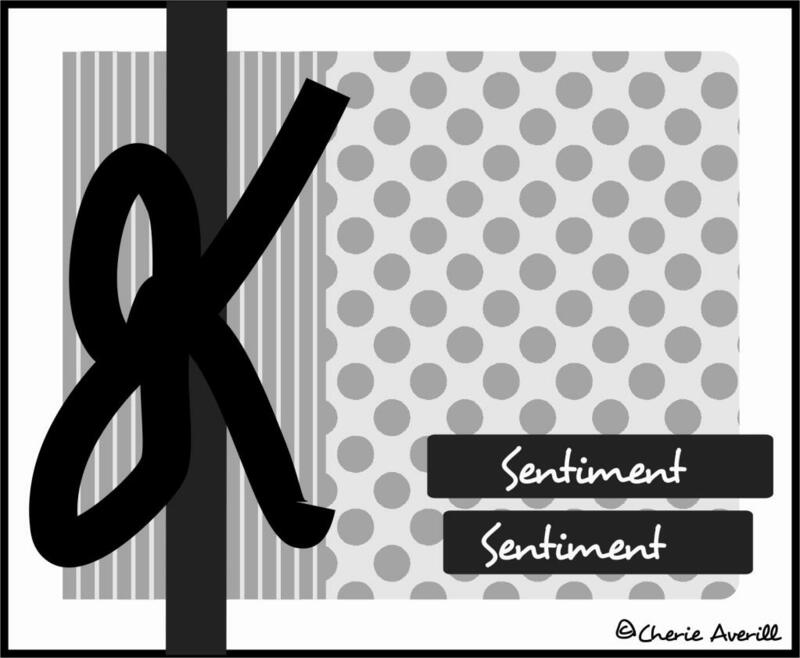 A card. I made it for 3 different challenge. The first is for the card sketch challenge at Sassylilsketches http://sassylilsketches.blogspot.com/ It is a fun sketch to work with. My second challenge was a color challenge at Sketches4you http://sketchesforyou.ning.com/forum/topics/color-combo-challengecard This part of the challenge was harder for me. I couldn't seem to find papers that worked. I eventually came up with these papers and am not 100% sure I like it. 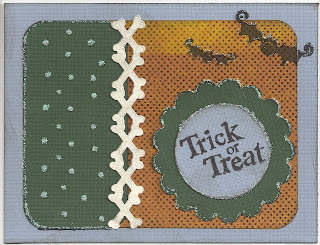 Denise's challenge was to make a Halloween card or layout and you must use at least two different stamps and inks. 2nd place winner is Kelly Massman! Congratulations to both girls!! They did mostly doubles of every challenge sketch offered!!! They are still posting all the individual Sketch challenge winners...so if you entered you should go over and check it out. I decided to make it a Christmas themed layout because I needed a break from fall (LOL). Hope you didn't miss me too much this weekend. I took a little blog break. But I am back today with a new layout to show you. The Sketch A Thon ends today at sketches4you. I already did all the sketches for the Sketch A Thon so I decided to do a layout and combine 3 new challenges at S4U. And the last challenge was from Fia. It is a sketch challenge for the October Scrap Girl Of the Month (SGOTM). It is a super cute sketch and was a joy to use. Most of the stuff I used was from a kit from Making Memories that I got for super cheap at Scenic Route. The paper from the flower is from My Minds Eye Halloween Scary Sparkles paper pad. After the busy month at S4U, I decided to take the weekend off. And I didn't hardly even go into my office/craft space this weekend. It didn't hurt that I have been feeling a little sick and didn't really feel like scrapping (or doing anything else for that matter). I'm feeling a bit better today. So he is getting all set up. We are interviewing another realtor today. We weren't sure we were sold on the other two who interviewed with us. So, another meet, greet, and show around this afternoon. Hope your day is filled with good things! First - The Sketch A Thon is almost over at Sketches4you (link on sidebar). You still have time to enter in any of the sketch contests you can get done. It ends on Monday, October 4th. So, go check it out and maybe win some prizes!! 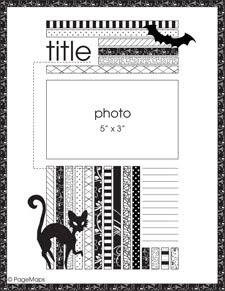 Second - Fia is having a Halloween Party at Sketches4you (link on sidebar) She started it today and posted a fun sketch. You don't have to actually use a Halloween picture, just use Halloween colors. Here is the sketch and the layout I made for it today. I used My Minds Eye "Boo to You" paper and embellies and some Alpha stickers from Scenic Route. I added sparkle with crystal Stickles. 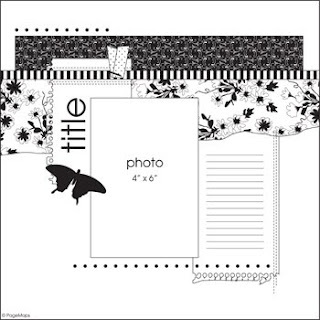 Third - I have posted a new Card Challenge at Sketches4you (link on sidebar -see a trend?? lol) You have to made a card following this pagemaps sketch and the kicker is that you must use a toilet tissue roll on it in some way!!! I used my TP roll to make a gift card holder for the front of my card. 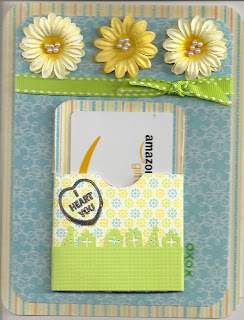 I wish you would all come join in my card challenge this month...I will be giving out a really nice RAK to the winner. This challenge last until Oct 14th by 11:59pm PST. I said yes. I mean...what an honor! It is a really fun sight with some great challenges and awesome people so come over there and join me in the challenges too.